Why is BioSmart superior to other microbial drain line and collection system inoculants on the market? – FAST ACTING – BioSmart begins working immediately when introduced in a drain line or collection system. These friendly bacterial cultures do not require a wake up period as with other microbial products. – EASE – BioSmart is easy to use and a simple pour and go. No pre-mixing, the convenient drain back bottle cap measurer is used to add the correct amount of treatment to the drain line or collection system. – VALUE – BioSmart requires one half capful per treatment. One half capful has more activity than 5 capfuls of other bio-products. – ELIMINATES EMERGENCY CALL BACKS – BioSmart continues to work long after the service call. The Hungry Bacteria® continue to feed on the organic residue left in the drain line, grease trap, and septic tank long after the technician leaves. 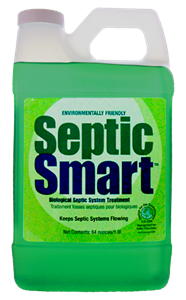 – EPA LETTER OF RECOGNITION – BioSmart has met the EPA’s DfE challenge for biological drain line and septic system products by demonstrating a more positive human health and environmental profile. 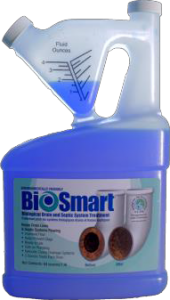 BioSmart is a patented microbial drain and septic treatment.